Welcome back to Technique Tuesday! Here’s the last part of that series looking at what artists use for reference (we’ve already looked at painting from photographs and from the imagination). Today’s post will be a bit different, as it’s a guest post written by Principle Gallery still life artist Elizabeth Floyd. 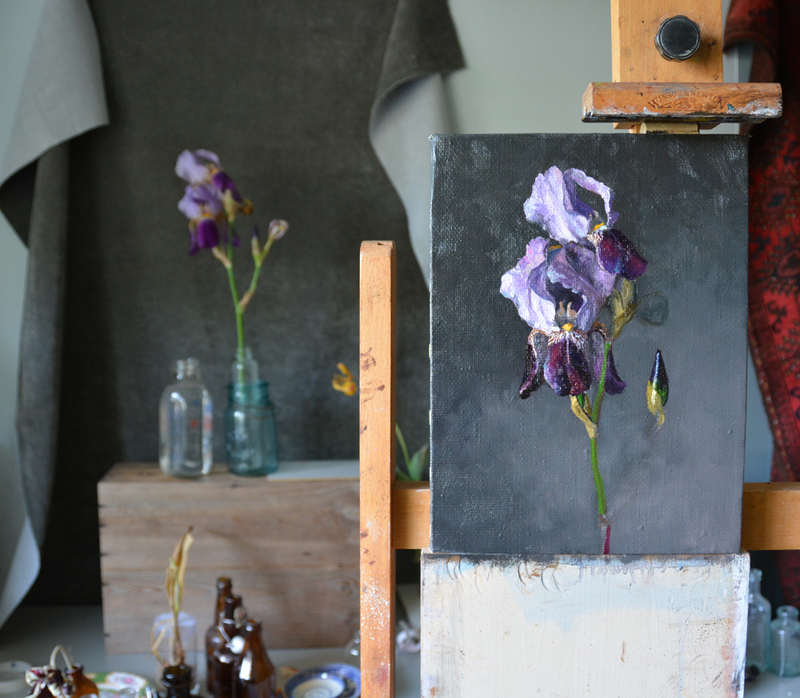 As a still life painter who frequently paints flowers from her very own garden, Elizabeth was kind enough to give us a glimpse at the process of painting directly from life, and why she enjoys it so much. My preferred method of painting floral still-lifes is to work from life in the natural light that filters through my studio’s north-facing window. I enjoy this method of painting because the experience is all about what is happening right here and right now. When painting flowers, I feel like I am capturing my thoughts and feelings of that particular flower, and of that particular moment in time. It is a moment in time that is fleeting. In the hustle and bustle of our lives, such a moment is so easily forgotten. I seek to stop to capture the moment before the loss, even if it just one little snapshot of what was going on. By focusing on what is in bloom, and on what the quality of light was at that specific time of year, I feel as if I am also recording the moments for prosperity, something to share and savor with others now and in the future. And often time goes by so quickly that flowers come into bloom and fade before I have the pleasure of exploring their unique qualities. During the month of May, I felt lucky to have had the opportunity to paint this painting of purple irises because the irises in my garden only bloomed for less than two weeks this year, a very short time to my thinking. I took pictures during the painting process, and thought to share with you here a portion of my process. There is a special level of energy that fills me when painting from life. I feel more attuned and connected as an artist when I am standing in front of a still-life setup. The emotions I am trying to share through art are also easier to connect with. 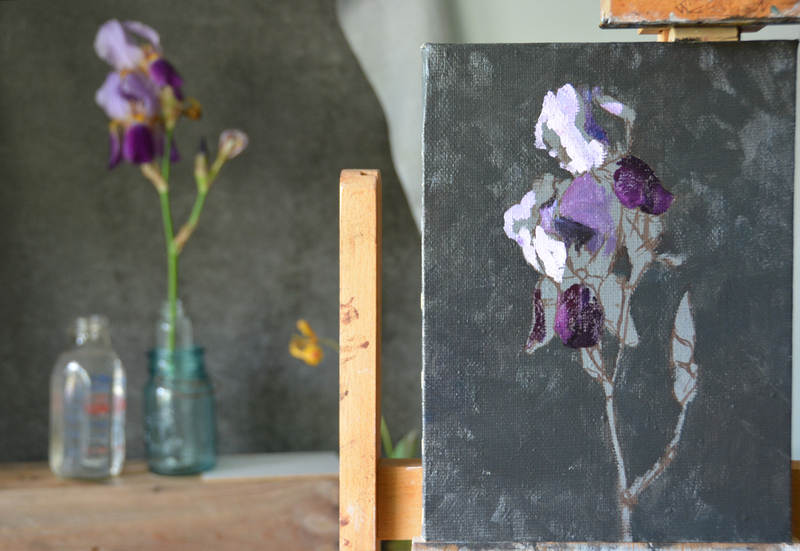 Often I know the flower will only last a short time in the studio, making the time special. Irises, in particular, last only one, maybe two days as cut flowers, especially if the weather has been hot, which was the case during the first weeks of the recent month of May. When I begin a painting I often begin with a detailed drawing in burnt umber. 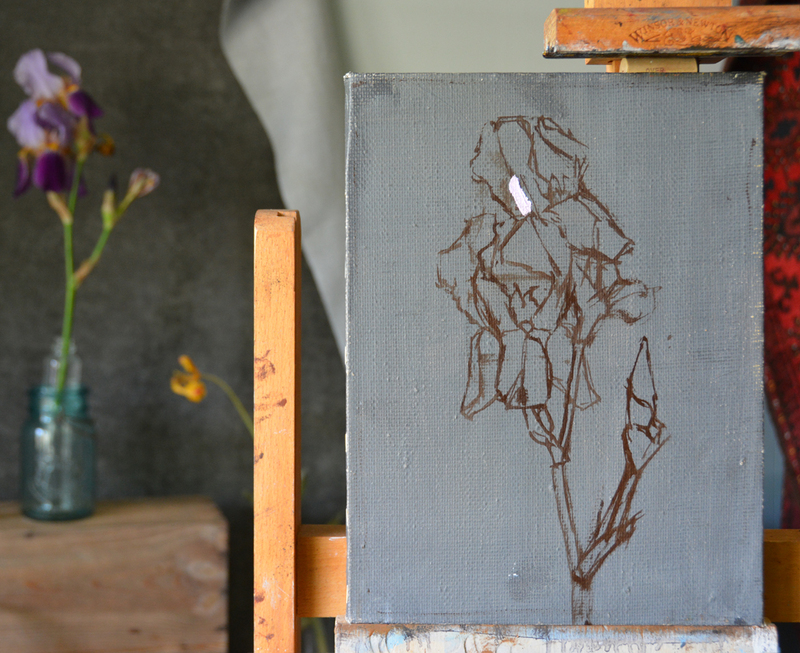 This step helps me place the subject on the canvas and helps me imagine what the final painting will look like. By placing the first strong color notes of paint down at the beginning, I try to capture the large shapes, knowing that the nuanced shifts in value and color temperature will occur later. With the large masses of color, if I begin to obliterate my drawn-in lines, that is fine because the drawing was only to verify that the composition I had in mind would fit on the canvas. By the time I have begun laying down paint, my mind has shifted to think more about color and mass. 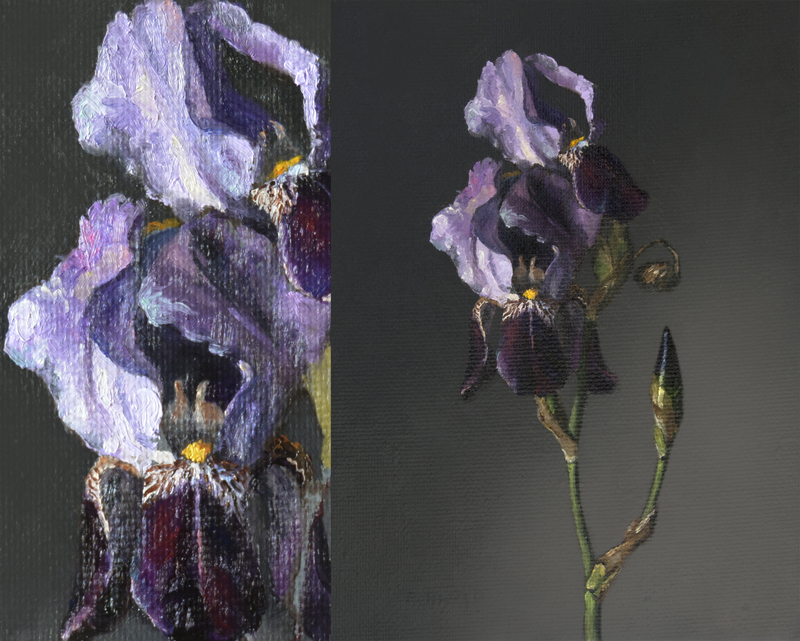 With limited time to capture these irises, I focused on the areas that were most likely to significantly change during the night before I could return to the painting. I painted the two flowers in full bloom and the bud to the lower right. In the actual flower, I chose to ignore the faded bloom next to the bud. 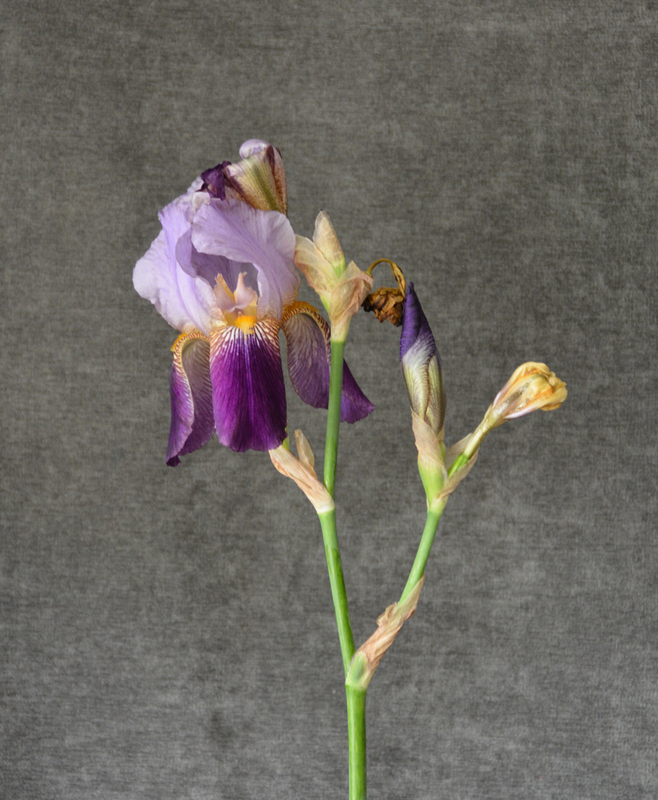 By the next morning, the topmost iris had wilted on me. But because I had captured this flower the previous day, I was able to focus on other aspects of the painting that needed to be refined and developed in the subsequent painting sessions. Another reason I prefer to paint from life in natural light, is that I am better able to observe the more nuanced shifts of color and value in the subject. For me, this ability to really see and discern the subtle shifts in color is so rewarding. I get lost in the moment. 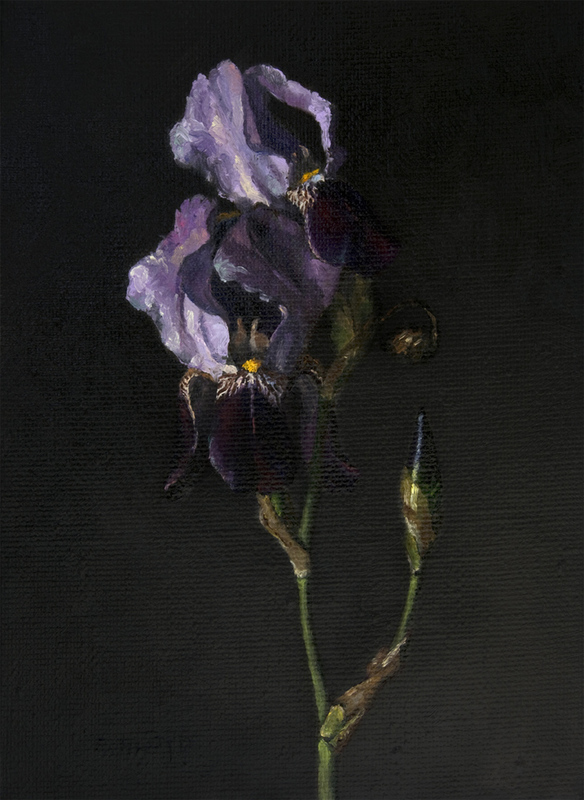 With this painting of the irises, I became enthralled by the shifts of purple that moved towards either warmer or cooler color temperatures, capturing the way that the afternoon light sparkled and played along the delicate petals. It is always an honor to me that I get to spend my days contemplating and discerning the details that make up our world, painting delicate objects that grow in my garden and sharing some of the fascination I feel when observing their details. It is especially great timing to have a post featuring Elizabeth Floyd, as her work will be part of the next exciting event we have coming up at the gallery! This August, Principle Gallery is honored to host the 10th Annual Juried Exhibition for IGOR, the International Guild of Realism! This fantastic show will feature 81 artists and 90 paintings and drawings, including two gorgeous still life paintings from Elizabeth Floyd. We are thrilled to be hosting this exhibition, and we look forward to sharing more information about it as the event gets closer! To stay up to date on all of our blog posts, make sure you subscribe to receive new posts by email, by putting your address in the bar at the top right of the page! Beautiful work! I love Elizabeth Floyd’s style.